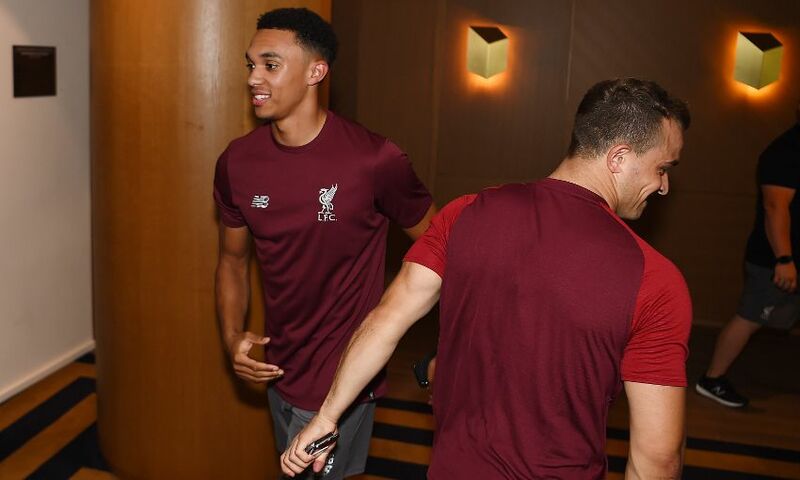 Trent Alexander-Arnold pushed his own case to start pre-season training early – and is now determined to make up time with a view to playing again as soon as possible. The Liverpool defender joined up with his teammates at their camp in Evian, France on Tuesday evening after a post-World Cup holiday. Alexander-Arnold’s excellent form for the Reds as they reached the Champions League final last term had earned the 19-year-old a place in the England squad for this summer’s international tournament in Russia. He was therefore entitled to a break from club duty until next week but successfully put forward a case to come back ahead of schedule, and is eager to pull on the Liverpool shirt again at the earliest opportunity. “It was a long season and I didn’t get to have the summer rest the other lads had,” Alexander-Arnold told Liverpoolfc.com in between Wednesday’s menu of three sessions. “But you want to get back as soon as possible. I spoke to the manager and he understood that I’m young and maybe didn’t need as much rest as the other lads because I was still fresh. He allowed me to come back early. Alexander-Arnold returned to a Liverpool squad that has been strengthened in several areas since defeat against Real Madrid in Kiev. Goalkeeper Alisson Becker, midfielders Fabinho and Naby Keita, and forward Xherdan Shaqiri are all now with the Reds having sealed moves to the club over the summer. “We have made some really good signings. It’s making our squad stronger and it makes us a better team,” the No.66 said after his first glimpse of the quartet up close. Alexander-Arnold was on the verge of glory with both club and country in recent months, first losing the Champions League final with Liverpool before England were eliminated in the World Cup semi-finals. But the Scouser has had time for perspective to kick in and wants to use the ‘dream’ experiences he enjoyed along the way as motivation to do even better. “Being able to represent your country at a World Cup and playing in a Champions League final at 19 is something not many people can say they’ve done. It was a very proud summer,” said Alexander-Arnold.